Some time ago I "stumbled over this recipe on tomato rhubarb jam, which I found to be a very interesting combination for a jam. Yes, everyone knows rhubarb jam or the classic combination of strawberry and rhubarb, but a combination of tomato and rhubarb !!!! This combination facinated me enormousely. So I had to make this jam. 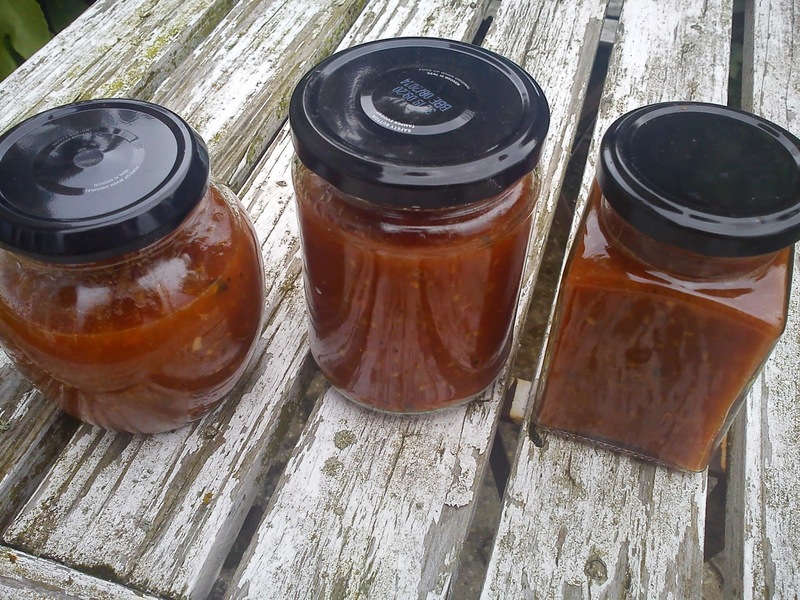 Luckily enough my good girl friend in Horsens was able to help me out supplying both the tomatoes and rhubarbs for this jam from her kitchen garden. I more or less made this jam according to the oirginal recipe adjusting the volumes of rhubarb and tomatoes to what I received from the kitchen garden in Horsens. And on top of this I added in pectin for texture adjustment. I noticed that, when the jam was being more acidic in the taste, the taste of rhubarb was more dominating, while a more sweet taste was bringing the taste of tomato more into the jam. So you can use the sweetness level to adjust the final flavour profile of the jam, should it be rhubarb alone or a combination of rhubarb and tomato ? 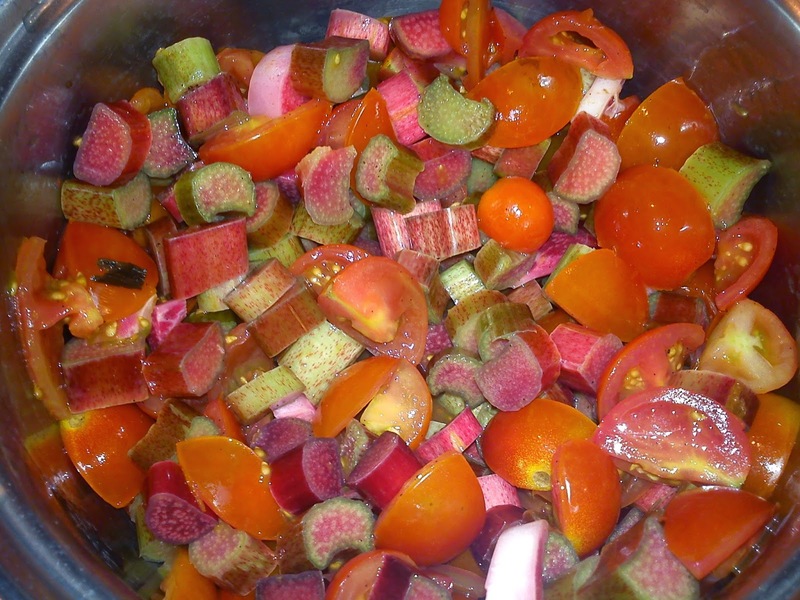 Put tomato and rhubarb pieces together with vinegar and vanilla into a small cooking pot. Heat up the ingredients to 80'C. Dry-mix pectin and 50 g of sugar. Add this dry-mix slowly to the jam stirring very well to avoid lump formation. Let the jam cook slowly for another 5 minutes. Stir on a regular basis. Taste the jam. If you find it too be to sweet/matured in taste, you can add some more vinegar to bring freshness back to the jam. I normally do this in smaller steps, so I can fine tune the flavour profile to my preference. It is more easy to add some extra, than to remove an overdose of something. Fill the glass with jam and when close the glass. As described earlier I am in the process of getting a new kitchen, where I besides from a new kitchen and new appliances also will have installed a floor of tiles in the kitchen. The existing tile floor moved in together with the kitchen, when my end row villa was built back in 1991, meaning they are now 23 years old, so it's probably about time that both parties "move away from home". Further, the top glazing from the tile is easily removed, if anything falls on the kitchen floor, whereby showing off some very visible black spots from the base of the tile. So by now I have a spotted white tile floor. I have been looking at various tiles at different places in Vejle, where my original desire to maintain the current white tile on the 20 cm x 20 cm is very unusual !!! The tiles of today are mainly 30 cm x 30 cm or even larger (60 cm x 60 cm) in those dull colors: black, gray and beige, but not white !!!! Therefore I have given up on my dream of getting a white tile floor. After yet a visit to kitchen company, I saw a flooring store right next door, so I went inside to look around. And here I met my future tile !!! It has same colour from top to bottom in light gray with a marbled pattern in a size 30 cm x 30 cm. 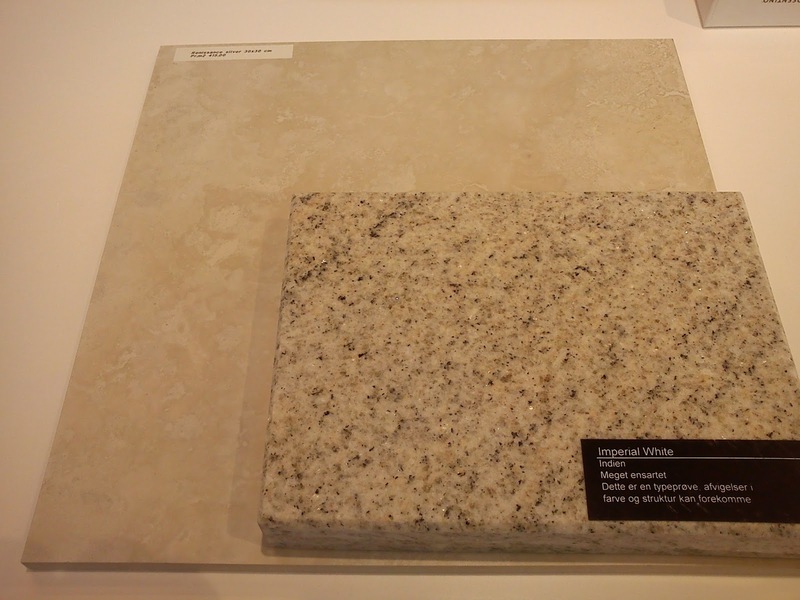 This color will fit perfectl with the new granite countertop in light colour. Instead of getting the tiles laid diagonally, they will laided in right direction with a less visible grouting. 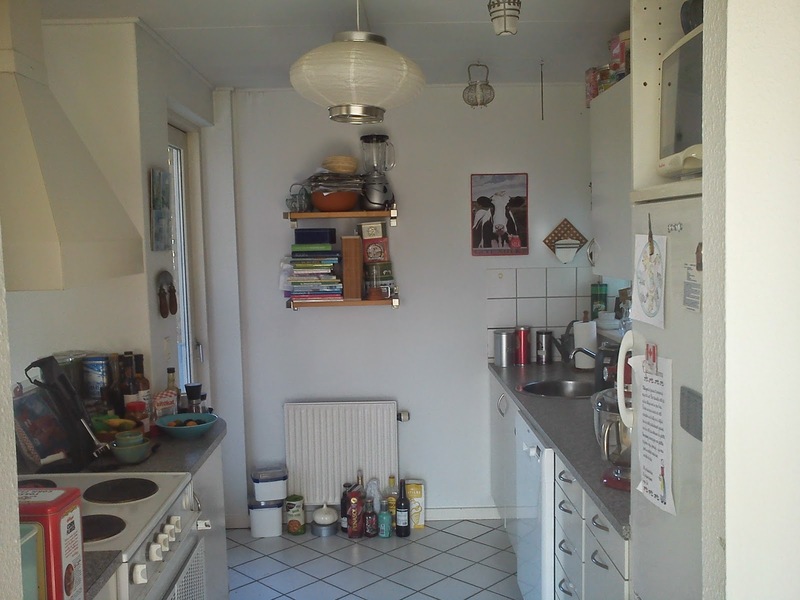 So I expect that a more even floor will make the kitchen appear larger than the 7 m2. With the coming of tile color and pattern, I also assume that Hannibal the Cat's daily paw prints back and forth from the food bowl will be less visible than they are now at the all-white tile floor. The mason was around this week to look at the floor. 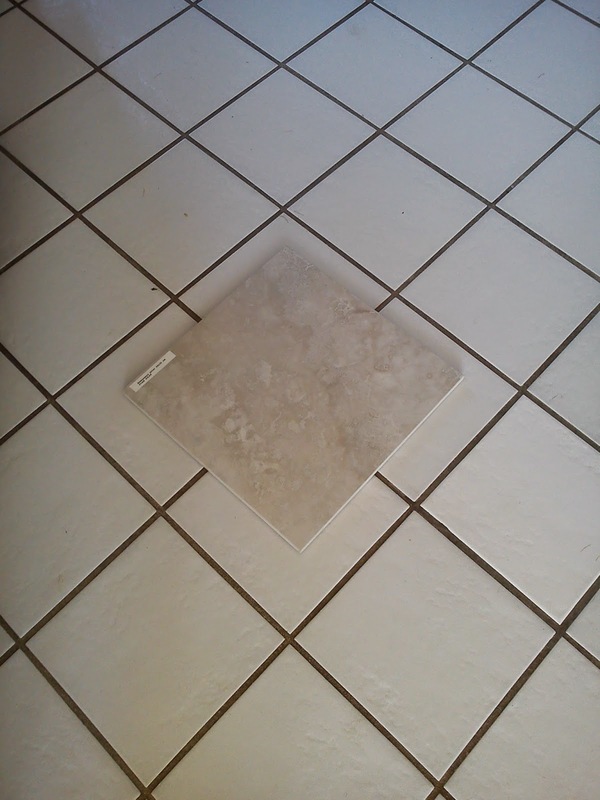 It is not possible to put the new tiles on top of the existing tile floor, as there are several loose tiles so that the old tiles need to be peeled off. So that's the situation, I am fine with it. Som beskrevet tidligere så er jeg i gang med projekt køkken, hvor jeg udover nyt køkken og nye hvidevarer ligeledes skal have lagt et nyt flisegulv i køkkenet. De nuværende fliser flyttede ind sammen med køkkenet, da min enderækkevilla blevet bygget i 1991, så de er nu 23 år, så det er vel på tide, at de "flytter hjemme fra" sammen med køkkenet. Desuden bliver overglaseringen nemt slået af, hvis der tabes noget på køkkengulvet, hvorved der bliver synlige sorte pletter fra underdelen af flisen. Så efterhånden har jeg et spættet flisegulv. Jeg har derfor kigget på gulvfliser forskellige steder i Vejle, hvor mit oprindelige ønske om at bibeholde den nuværende hvide flise på 20 cm x 20 cm er meget usædvanligt !!! Nutidens fliser er nemlig 30 cm x 30 cm eller endda større ( 60 cm x 60 cm) i de der kedelige farver: sort, grå & beige, men ikke hvid !!!! Så jeg har derfor opgivet drømmen om at få et hvidt flisegulv. Efter endnu et besøg hos et køkkenfirma, så jeg en gulvbutik lige ved siden af, så jeg gik indenfor for at kigge mig omkring. Og her mødte jeg min kommende flise !!! Det er en helt gennemfarvet flise i lysgrå med marmoreret mønster i 30 cm x 30 cm. Og farven kommer til at passe perfekt sammen med den kommende granit bordplade i lys farve. I stedet for at få fliserne lagt diagonalt, så skal de nye fliser lægges ret med en mindre synlig fugefarve. Herved forventer jeg at få ensartet gulv, som vil få køkkenet til at virke større end de 7 m2. Med den kommende flisefarve og mønster, så antager jeg også at Hannibals daglige pote aftryk frem og tilbage fra madskålen vil blive mindre synlige end de er nu på det helt hvide flisegulv. Jeg har haft mureren forbi, som skal lægge det kommende gulv. Det er ikke muligt, at lægge de nye fliser ovenpå det nuværende flisegulv, idet der er flere løse fliser, så de gamle fliser skal skrælles af. Så sådan er den situation, så det lever jeg fint med. From my last shopping expedition to Flensburg I brought various teas from Teehaus Flensburg incl. this summer tea. Now the time has come for me to enjoy this German version of liquorice tea. 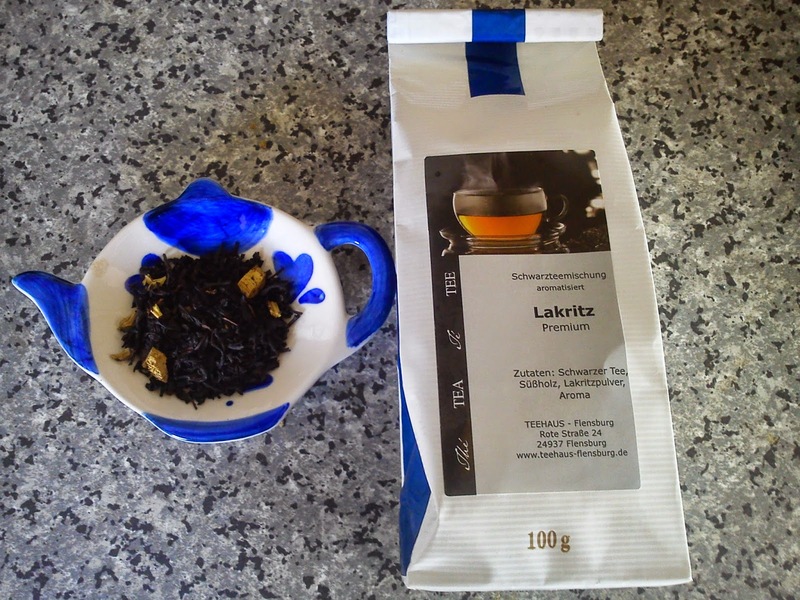 The tea is a black tea with liquorice roots, liquorice powder and flavour. The interesting question is now, if the taste of liquorice is strong enough for the people of Scandinavia, which will have certain requirements as to the strength of the liquorice taste. I can confirm, that the tea is tasting of liquorice, perhaps I as liquorice addict could do with a little more liquorice taste, as you will have in Danish produced tea blends. The weather is changing from being full of sunshine and blue sky to much more typical Autumn style with lower temperature, grey sky and rainy days. Therefore I decided to use up all my outdoor tomatoes in one go by making home-made tomato sauce for the very first ever. For me it is also a way of saving a wonderful Summer for later use in my little kitchen, when the rainy and grey days start knocking on the front door !!! This home-made tomato sauce will also be my contribution for the monthly blogging challenge Tea Time Treats, which is hosted by Karen from Lavender and Lovage and Janie from The Hedge Combers. As theme for September, Janie was selected Mediterranean food. Being a lazy cook I did not see the need for removing the skin from the tomatoes, before turning them into tomato sauce, as everything is being blended together at the end. The skin of the tomatoes also equals fibre, so it is a more healthy sauce - perhaps !!! 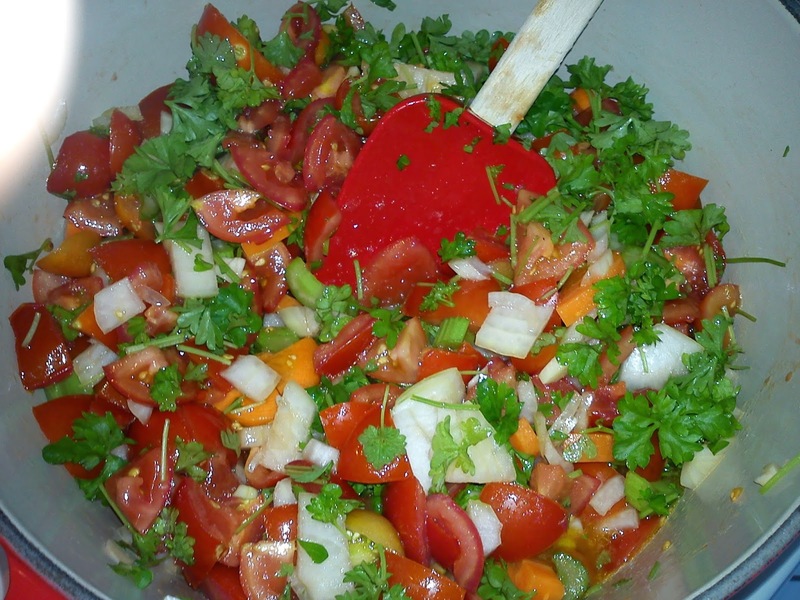 Place the tomatoes in a large cooking pot together with celery, carrot, onion, garlic, parsley, vinegar, honey and olive oil. Bring the pot to a quiet simmer and let it simmer gently with the lid on the cooking pot. Let it simmer for one hour, while you from time to time give everything a stir. After one hour blend everything together. To boost the sweetness of the tomatoes I added into some brown sugar as well. Pour the tomato sauce into smaller containers, which is cooled down, before they are placed in the freezer for later use. 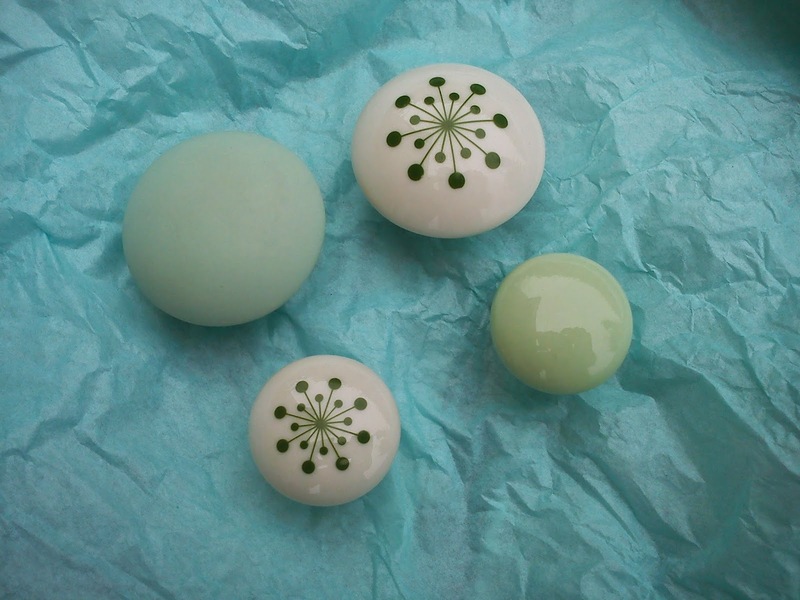 I have found these porcelain handles for my future kitchen from Anne Black. Therefor I bought this small selection of handles, which I had with me for a meeting at kitchen company, where I was presented for a kitchen suggestions. So I could be confirmed at once if, these handles could be applied instead of the usual "standard" handle from the kitchen company. It was a really good rowing friend of mine, which provided me with the excellent idea of finding "my" own handles instead of "just" picking something standard from the kitchen company. So a huge thank you to her for this great idea:-) By doing this I am able to put my own signature on my future kitchen. 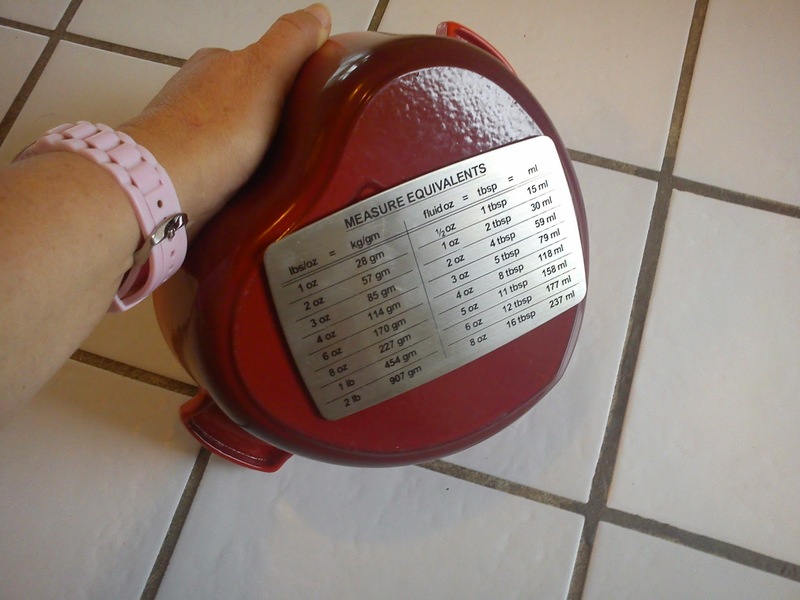 And yes, the big handle of 4.5 cm in diameter can easily be used to both cupboards and drawers. And the kitchen company is able to place these handles in connection with putting up the new kitchen :-) I have decided to buy the green handle with glossy surface to the right side of the photo in big size of 4.5 cm. These handles were ordered (with volume discounts) at a dealer here in Vejle yesterday. This is the second step been organised in connection with my kitchen project. The first step was of course to ensure the money at the bank. Jeg har fundet forskellige porcelænsgreb til mit kommende køkken fra Anne Black. Jeg købte derfor dette lille udvalg af greb, som jeg tog med mig til et køkkenmøde, hvor jeg skulle have præsenteret et forslag. For så kunne jeg få afklaret med det samme, hvorvidt disse greb på anvendes i stedet for de sædvanlige "standard" greb fra køkkenfirmaet. Det var en rigtig god roveninde, som gav mig ideen med selv at finde "mine" egne greb i stedet for "bare" at udvælge et eller andet greb hos det pågældende køkkenfirma. Så en stor tak til hende for denne brilliante ide :-) Herved får jeg sat mit eget præg på mit kommende køkken. Og ja, de store greb på 4,5 cm i diamater kan sagtens anvendes til lågere og skuffer. Og pågældende køkkenfirma vil gerne montere disse greb i forbindelse med opsætningen :-) Jeg har bestemt mig for at vælge det helt grønne greb med skinnede overflade til højre i billedet i stor størrelse. Så disse greb er nu bestilt (med mængderabat) på en forhandler her i Vejle. Hermed er andet trin ordnet i forbindelse med mit køkkenprojekt. Første trin var jo at få styr på pengene hertil i banken. My good friends and colleagues, who knows me and my fascination for creating eatable things in my little kitchen, are all very good at grabbing hold of me offering me surplus fruit and vegetables from their gardens. This time I got a sms from a rowing friend saying " are you interested in plums ? as I have plenty on my tree" - "yes, I will come by your place after work" was my reply. So I came back to my kitchen with both plums and a recipe for how to make baked plums :-) Back in my comfort zone of my kitchen I decided to twist the recipe by adding in various spices to twist the taste. Using smaller glasses for storage means a better shelf-life, as you take 1-2 smaller glasses for later use instead of opening and closing a bigger storage glass on several occasion with the risk of growth of yeast and mould. Using smaller storage glasses also means, that you should a few of these glasses as hostess presents during the festive season. Heat the (conventional) oven to 150'C. Prick the plums with a fork. 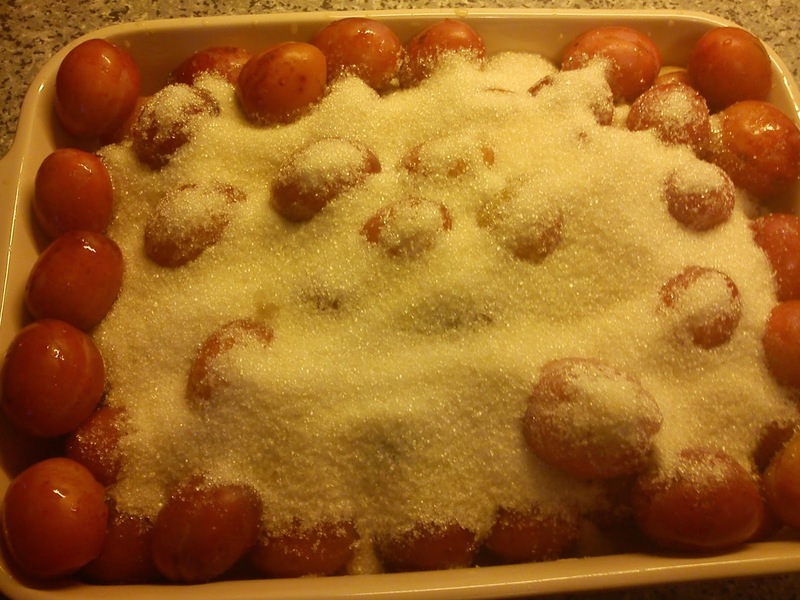 Place plums, sugar and spices in a large baking tray. Cover the tray with silver foil. Bake the plums at 150'C for 1½-2 hours. Prepare the storage glasses by filling them with boiling water for 4-5 minutes. Stir in the rum in the baked plum mix. Fill the storage glasses with the entire mix of baked plums. This time I have decided to twist this jam recipe on blackcurrant jam with liquorice and lemon by replacing the blackcurrant with blackberries, as it is time for balckberries here and now in Denmark. As usual I use addition of vinegar at the very end for taste modification, as I find vinegar to bring the fruitness into jam. Do the addition little by little, so you do not overdo it. Heat up the blackcurrant, lemon juice and zest in a cooking pot. Heat the fruit up to 80'C. Mix the pectin/gelling powder together with 50 g sugar. Add this dry-mix slowly to the blackberries, while you stir very well in the cooking pot to avoid lump formation. Let the blackberries cook slowly for another 5 minutes. Stir on a regular basis. Add in the rest of the sugar together with liquorice powder and sweet liquorice syrup. Any future for my pots and pans in a new kitchen ? My colleagues at work are following my kitchen project and reflection - I probably give them no other options ! Here I will make a technological leap of dimensions from my "old fashion" cooker with conventional oven and solid hotplates to hobs with induction and separate oven with various new technology such as hot air, cooking thermometer, heat from above or from below, pyrolysis , hydro baking, etc..
As my work colleagues heard that I will have hobs with induction, I was told that I probably would have to replace all my pots and pans !!!! Quiet many of my colleagues had experienced this. I saw, that I had to let go off my Le Crueset pots !!!! I almost went into shock - I love my Le Crueset pots. Before panic took over, I managed to understand as much, that the induction requires that the pots are magnetic. Next step was to find a magnet !!!! But who runs around with a magnet in their handbag? I certainly do not !!!! Think - think - think - I did went to sleep last night before, I remember, that I have plenty of magnets on my refrigerator, so out of bed and down in the kitchen checking the pot and pans with a magnet. Kan gryderne stadig bruges ? Mine kolleagere følger levende med i mit køkken-projekt og overvejelser - jeg giver dem sikkert heller ikke andre muligheder ! Og her vil jeg foretage et teknologisk kvantespring af dimensioner fra mit "gammelsdag" komfur med almindelig ovn og massive kogeplader og så til valg af kogeplader med induktion og særskilt ovn med diverse nymodens teknologi såsom varmluft, stegetermometer, varme fra oven eller fra neden, pyrolyse, hydrobagning osv. Da mine kollegaere hørte, at jeg vil have kogeplader med induktion, så fik jeg ellers at vide, at jeg sikkert skulle have udskiftet alle mine gryder og pander !!!! For det havde de fleste af mine kolleagaere nemlig oplevet. Jeg så det for mig, at jeg skulle af med at mine Le Crueset gryder !!!! Jeg gik næsten i chok - jeg elsker mine Le Crueset gryder. I forstadiet til chokket opfattede jeg dog så meget, at induktion kræver, at gryderne er magnetiske. Næste skridt var så at finde en magnet !!!! Men hvem render rundt med en magnet i deres håndtaske ?Det gør jeg ihvertfald ikke !!!! Tænke - tænke - tænke - jeg nåede næsten at falde i søvn i går aftes, inden at jeg fandt ud af, hvor jeg kunne finde en magnet. Jeg har i hobetal af magnetter på mit køleskab, så jeg sprang ud af sengen og for ned i køkkenet, for at få afklaret gryde spørgsmålet. My tomato plants have not been a big success this year, as they have been struggling with potato blight coming from my potato plants. Therefore I will next year be placing my tomatoes in the part of my garden facing, whereas the potatoes will be placed in their pots in the Northern part of my garden. 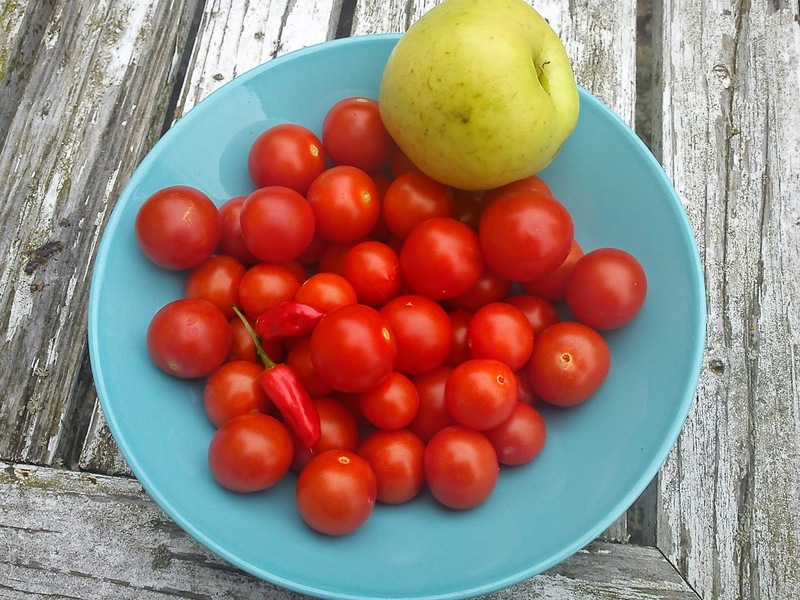 Any way one of the tomato plants has been full of smaller cherry tomatoes, so I decided to make my own tomato ketchup every using produce from my kitchen garden in form of tomatoes, chilies and apple using this Politiken´s tomato ketchup recipe as starting point. It was actually the first time for me to make my own tomato ketchup. I decided to adjust the viscosity of this ketchup of adding in some pectin. If you do this, you need to blend eveerything after addition, so you ensure, that the pectin is dispersed homogenous. Before addition of the dark brown sugar, the colour of the tomato ketcup was quiet light red. After addition of the brown sugar, the colour became much more dark red !!! Interesting colour changes. pectin - optional for viscosity adjustments. Roughly chop all the ingredients. Put them into a small cooking pot together with vinegar and spices. Boil everything until the apple pieces are soft. Blend everything together using a blender. Taste the tomato ketchup, Adjust to desired by adding the dark brown sugar little by little. Vinegar can also be used for taste adjustment. Pour the tomato ketchup into jam glasses, which have been prepared by addition of boiling water in advance. Bank the liquorice roots with a rolling pin to open up these roots. 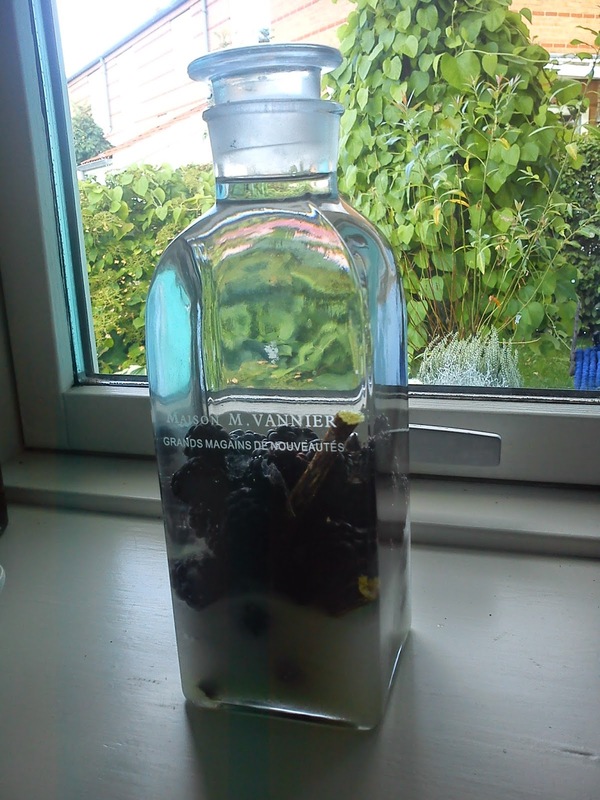 Place blackberries, liquorice roots and sugar into the storage glass. Pour the rum into the glass as well. Fill the bottle up with rum (light). Place in a dark place. Shake the bottle regular to dissolve the sugar, which is found at bottom. Be patient !!!!! The blackberry rum should be drinkable around Christmas time !!!!! Remove the blackberry, before drinking this rum. After having breakfast in Billund Airport, it was time for me during my long working day to have dinner at Helsinki Airport, before returning to Denmark having a stop over in Sweden !!! In Helsinki Airport I normally always eat at Fly Inn, Helsinki Airport, as the food in interesting and the restaurant is located away from the busy airport area full of passengers, which means I am able to relax more. 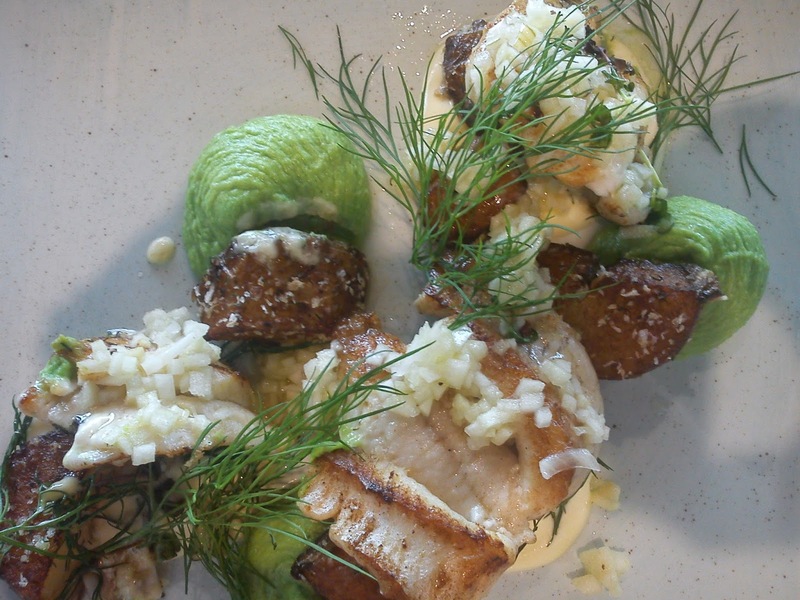 This time I decided to fish " chips with Finnish twist in form of fried pike-perch with mashed arctic potatoes and pea puree and finely chopped marinated onions. My only complaint about this main course was the actually size of it, as it was quiet small. I paided 46 € for this main course, a medium size glass of white wine and ½ l bottle water. I will give this main course four stars for it´s great taste and excellent look, but the overall portion was to small in my opinion. The weekly vegetable box, which I received last week was full of fruit in form of apple, pears and plums, so it has been a challenge for me to eat my way through all this fruit: Therefore I went looking for cake recipe containing pear, which I located among various Arla recipes: pærekage med marcipan. I have made no modifications to this recipe as I wanted to taste the "originale" recipe, before twisting it somewhere else. Heat up the (conventional) oven up to 200'C. Peel the pears, cut them into quarters and remove the flower stalk and cored. Cut the pears into pieces (about 2 x 2 cm) and turn them immediately in lemon juice. Beat butter and sugar together on a mixer until it crumbles. Whip in the eggs one at a time. Keep whipping until the mixture is light and airy. 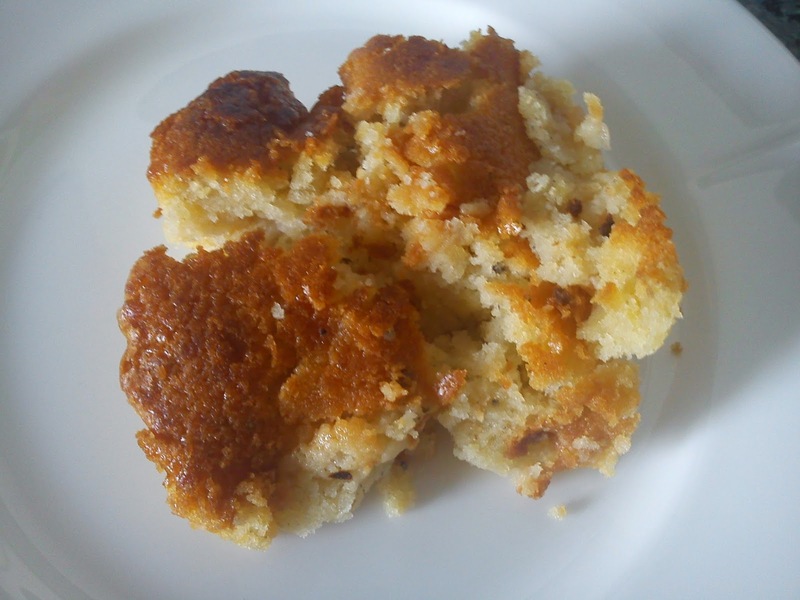 Mix flour, baking powder and cardamom together. Sieve it. Add milk and flour into the dough swifting between milk and flour. Add hand gentle mix into the marzipan, pear pieces in lemon juice and lemon zest. Cover a large baking tray (30 x 37 cm) with baking paper. Spread the dough in it. Bake the cake in the middle of the oven at 200'C for 35 minutes. After baking lift the cake out of the baking tray, and let it cool down on a wire rack. After long negotiations during spring of 2014, we reached a deal, so Hannibal has become an outdoor cat during nighttime, and when he returns for breakfast and some sleep in the morning, before I go to work. It is tough to negotiate with someone, who bites you in the toes during your sleep, in order to be let outside. Let´s see, if Hannibal will return to the warm duvets as the cold Winter night returns !!! During warm and dry Summer days Hannibal can also completely forget time, so there can go between 2-3 days, before he returns home. 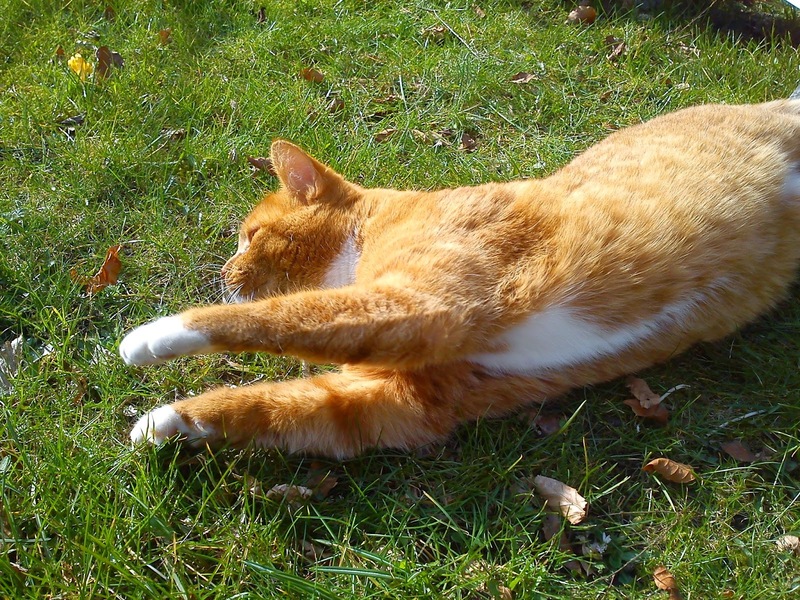 During such time I would like to have a GPS tracker on the garden lion, so I had an idea, where he is staying. 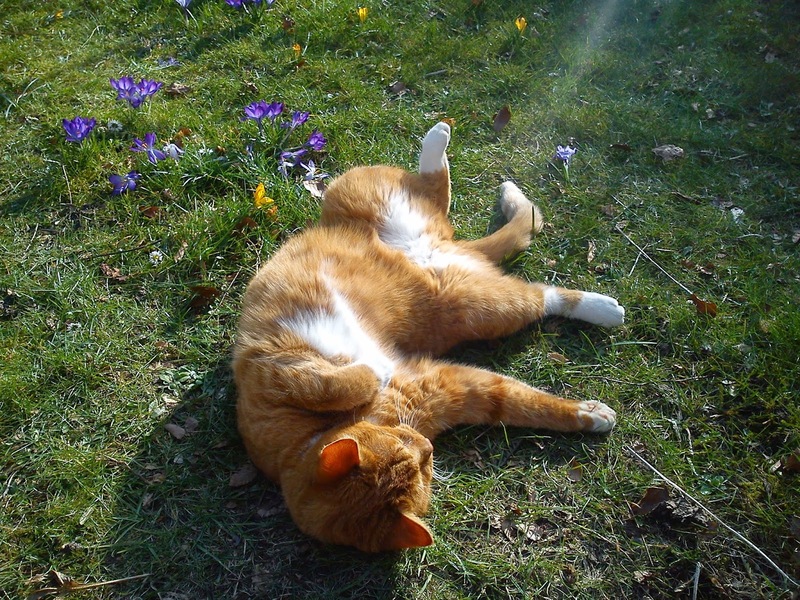 You never knows, if the cat has been closed in a house or shed, where the owners have gone on vacation. 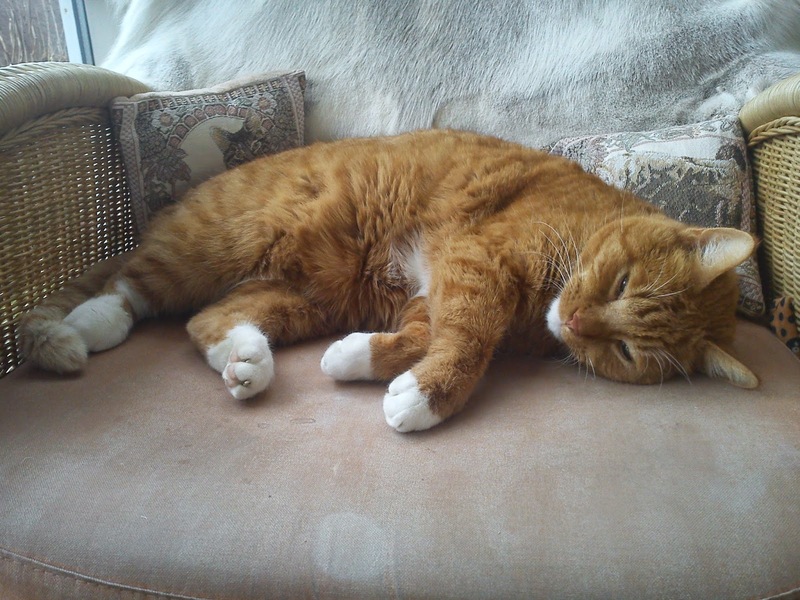 So happy birthday to you Hannibal and wish you all the best in the coming year and many mice to be caught and eaten as fresh as possible. 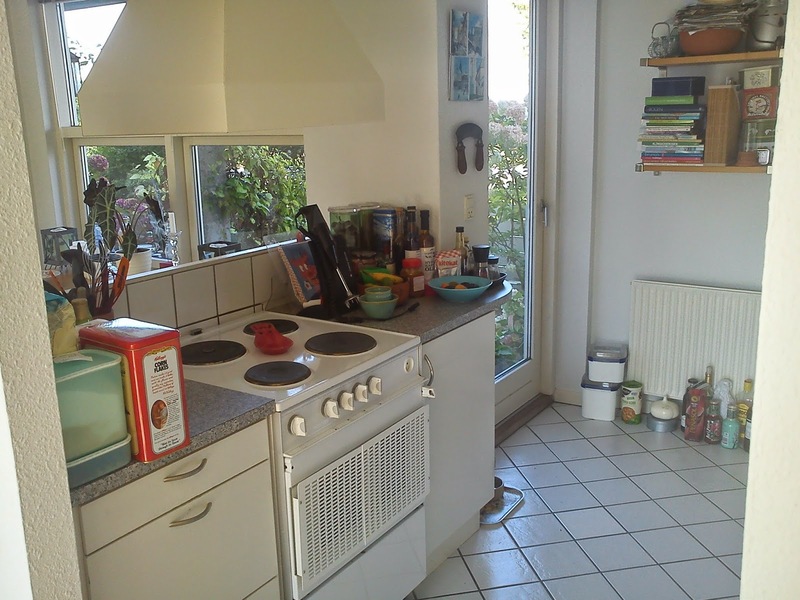 My HTH kitchen and I have now been living together for 10 years, before we moved in together, the kitchen has been through several other relationships during it´s 23 years. The only two things, which I did, when I moved in, were to paint the walls in the kitchen and replaced the grips from white square HTH-grip version 1990 with oval steel handles. With me craftsman capabilities, this is the one and only thing, which I can handle. On the other side I am really good at making jam and baking cakes. However, I have now decided to throw myself into a MEGA project in the form of "new kitchen" !!! which means new kitchen units, new appliances (stove, oven, fridge-freezer, dishwasher and range hood), new tile floor and new wall tiles. I have looked at the floor tiles, where I seem to have an unusual desire for a tile of 20 cm x 20 cm in white !!!! The tiles are now at 30 cm x 30 cm or even larger (60 cm x 60 cm) in those dull colours: black, gray and beige, but not white !!!! At one place I got a catalogue of 244 pages with tiles, where I could ordered sample tiles home to my kitchen to see for them in reality. I mean, how hard can it be, an ordinary white floor tile !!!! Fortunately enough I am living in Vejle, where the range of kitchen stores are large, very large indeed. So far I have visited HTH, Designation and Svane. And now I do not want to visit other kitchen stores !!! At Svane I walked away from the store with a plastic bag containing catalogues with a total weight of 2894 g !!! And at the Designa store I got the complete catalogue of appliances from Siemens. So I am not lacking reading stuff before falling a sleep at the moment. should the elements be with or without grips/handles ? should the elements be painted or in laminate ? should the drawers giblets be in wood or plastic? should the stove be induction? do I a cooking island? Oh, how the heck do I find the room for such a thing ! 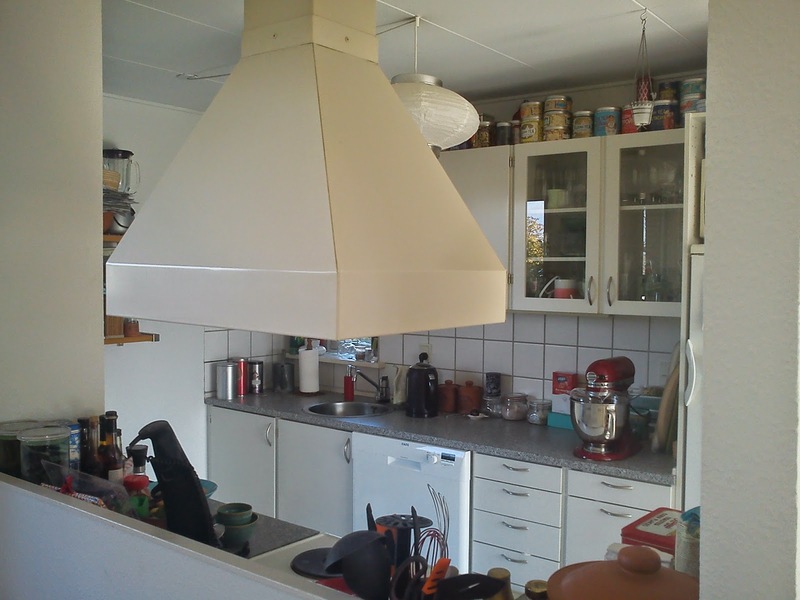 should it be Swedish country kitchen or trendy Italian style? will you do the dismantling of the kitchen yourself ? NO !!! And I will neither put the kitchen on my own or I will end up with all kitchen modules in one big pile on the floor. Every time you walk through the door to a kitchen shop you easy spend 1 hour answering all sorts of questions. Perhaps it is easier to buy a new house instead off ? I also am considering to use various ceramic handles instead of the usual metal handles on the kitchen units. And I am under no time pressure at all ? Well, if I would like to use the craftsman tax deductions I have to be finished before 31 December 2014 !!! So right now I am anxiously awaiting the various drawings and price estimates. And when I will start to hyperventilating !!! Mit HTH-køkken og jeg har nu boet sammen i 10 år, men før det har køkkenet været igennem flere andre forhold i løbet af dets 23 årige historie. Og det ene, som jeg gjorde i forbindelse med min indflytning var at få malet væggene i køkkenet samt udskiftet greb fra hvide firkantet HTH-greb version 1990´erne med ovale stål greb. Mine håndværkerevner rækker nemlig ikke længere end at udskifte greb, til gengæld er jeg rigtig god til at lave marmelade samt bage. Jeg har derfor besluttet mig for at kaste mig over et MEGA projekt i form af "nyt køkken" !!! hvilket betyder nye køkkenmoduler, nye hårde hvidevarer (kogesektion, ovn, køle-fryseskab, opvaskemaskine og emhætte), nyt flisegulv og nye vægfliser. Jeg har kigget på gulvfliser, hvor jeg tilsyneladende har et usædvanligt ønske om en flise på 20 cm x 20 cm i farven hvid !!!! Fliserne i dag er nemlig 30 cm x 30 cm eller endda større ( 60 cm x 60 cm) i de der kedelige farver: sort, grå & beige, men ikke hvid !!!! Det ene sted fik jeg et katalog på 244 sider med fliser, hvor jeg efterfølgende kan få bestilt prøvefliser hjem til selvsyn. 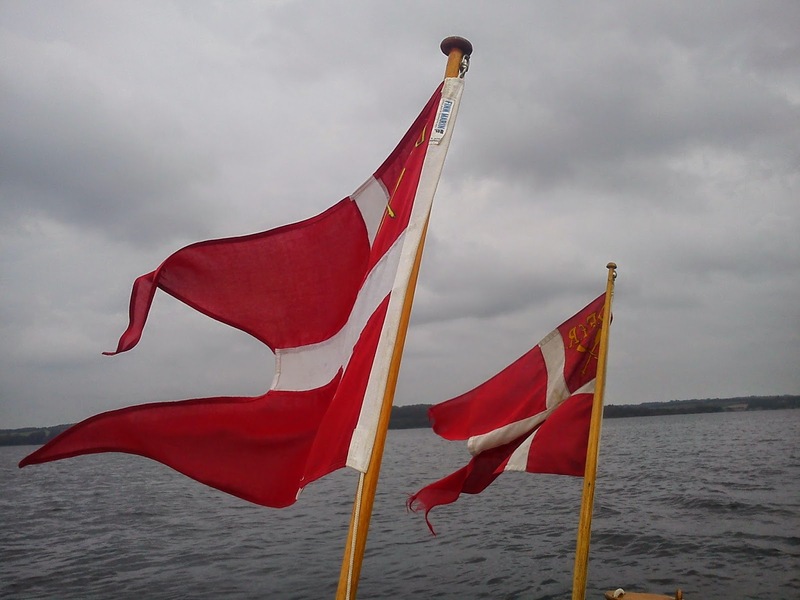 Jeg mener, hvor svært kan det være, en ganske almindelig hvid gulvflise !!!! Heldigvis bor jeg i Vejle, så udvalget af køkkenbutikker er stort, rigtig stort endda. Indtil videre har jeg besøgt HTH, Designa og Svane. Og nu orker jeg ikke at besøge flere køkkenbutikker !!! Hos Svane gik jeg ud af butikken med en plastikpose indeholdende kataloger med en samlet vægt på 2894 g !!! Og hos Designa fik et komplet katalog med hårde hvidevarer fra Siemens. Så jeg mangler ikke god nat-løsning i øjeblikket. skal elementerne være grebsfrie eller med greb ? skal elementerne være malet eller i laminat ? skal skuffernes indmad være i træ eller plastik ? skal kogepladerne være induktion ? skal jeg bruge en kogeø ? Nej, hvor pokker får jeg plads til den henne ? svensk landkøkken eller trendy italiensk stil ? vil du selve pille dit køkken ned ? NEJ !!! 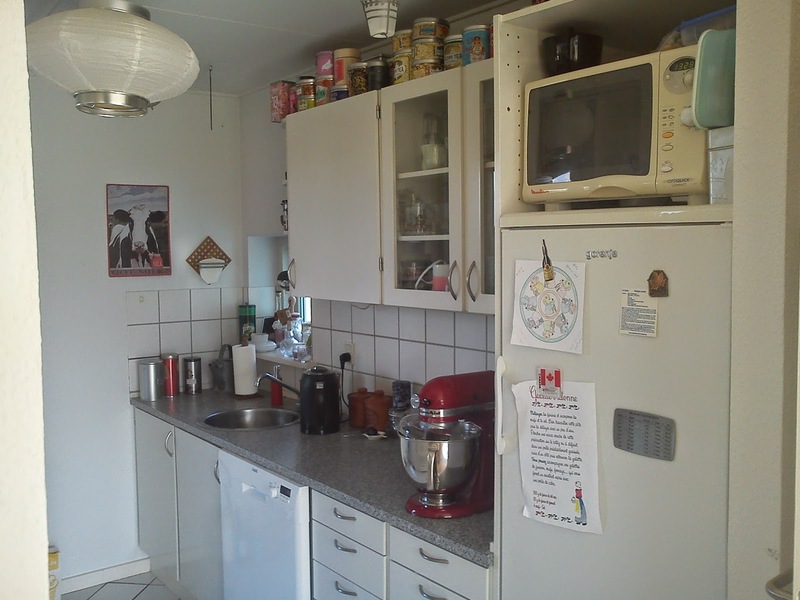 Og jeg vil heller IKKE selv montere mit eget køkken, for så vil det ende med, at alle køkkenmodulerne kun blev sat ovenpå hinanden på gulvet. Og der er går nemt 1 time, hver gang du bevæger dig ind af døren i køkkenbutik med at besvare alle mulige og umulige spørgsmål. Måske det er nemmere at købe et nyt hus i stedet for ? Desuden overvejer jeg kraftigt at få diverse keramik greb i stedet for de sædvanlige metalgreb på køkkenelementerne. Og jeg er jo slet ikke spor tidspresset, vel ? Bestemt ikke, hvis jeg skal have udnyttet min håndværker fradrag, der udløber d. 1. januar 2015. Nu går jeg spændt og afventer de forskellige tegninger og overslag på priser. For så kan jeg komme i gang med at hyperventilere !!! This week I had the "pleasure" of full working day spend in Finland = flying out of Billund Airport at 06.20, returning back in Billund Airport at 22.30. Such a full working day also meaning, that you are buying everything, that you eat and drink at the various airports from breakfast to evening meal. Having most of meals in airports can either be a disaster or good experience. 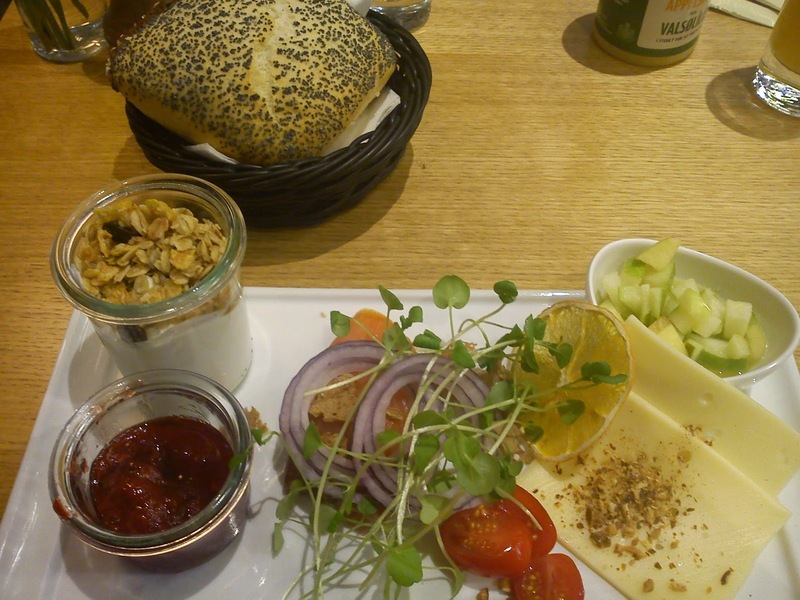 So I start my "eating programme of the day" having breakfast at Gastro in Billund Airport after the security check, having something like 35 minutes, before I needed to board the plan, so I thought, that I time enough to enjoy the breakfast menu. The breakfast menu consisted of salmon from the island of Fanø, Greek yogurt with muesli & maple syrup, organic Gouda cheese from Naturmælk, bread roll, rye bread, butter, strawberry jam and a fresh fruit salad. To be seated took approx 5 minutes, as the waiter is guiding you to available setting location, when you have to wait to the same waiter to take your order. So when I finally got the tea, juice and breakfast menu I had 12 minutes to stuff all the food and drink into my mouth and stomach !!! Eating under stress is not a pleasure for me (and I assume everyone will feel the same as I do), as I get the feeling, that the food is getting stuck somewhere between the mouth and the stomach !!! The breakfast menu is looking delicious, it tastes good and is quiet filling. But having to eat and drink everything within 12 minutes, before you have to go, is not a pleasure at all. I did pay upon receiving the food, so I did not have to panic about hold of the waiter, before running off to catch my flight to Copenhagen. This breakfast menu incl one cup of tea and orange juice costed 146 DKK. And I will this experience 2 stars, not due to low food quality, but due to stress coming from the time pressure !!!! I have no idea if, this time pressure comes from to few waiters or too long time to prepare the breakfast menu, but looking at it, most of this breakfast menu can be prepared in advance, so it could take very little time to serve.